Welcome to All Things Dog Blog's Easter Rabbit Adoptathon and Blog Hop. 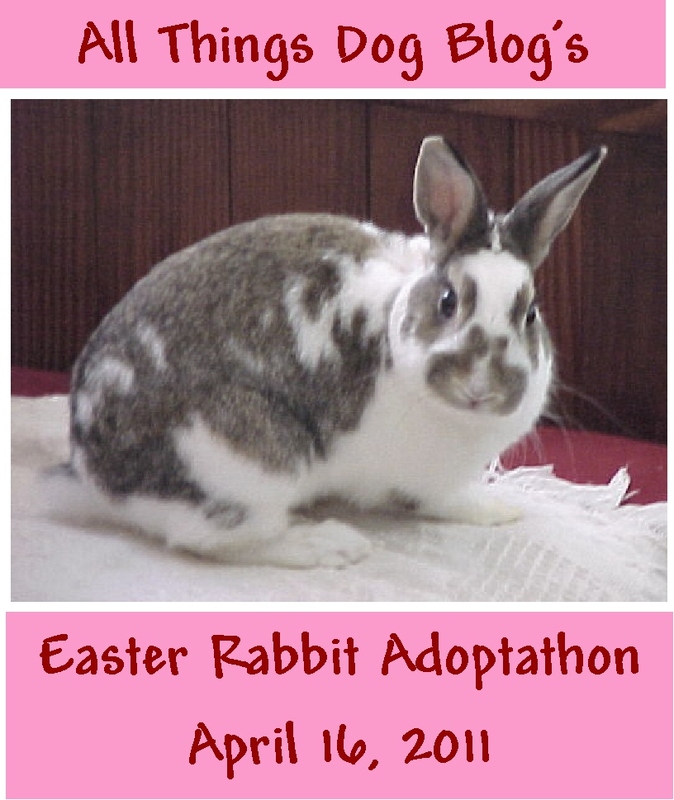 We're excited to host this event in honor of our family's rabbit, Robby, whom we rescued in 2002. He's an adorable and affectionate little guy that has given us many laughs, and even more nose wiggles. Today, we'll be highlighting adoptable rabbits around the country. Other blogs will be linking up to participate along with us, so you can peruse the photos below to 'shop', or simply enjoy the adorable pics. I'm going to bounce to the opposite corner of the country and start with Idaho first. 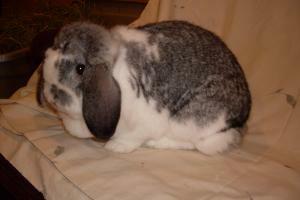 My first selection was made because Ruby has similar coloring to Robby, yet is lop-eared. I bet he'd think she was a real cutie-pie. Ruby is about 2 years old and weighs 6 1/2 pounds. She is available in Hayden, Idaho. 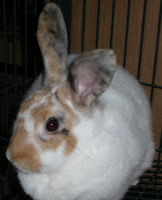 Her foster family recommends she be adopted to a family with other rabbits, as she enjoys having rabbit companionship. Her bio at the link includes a good bit of information on her, so drop on over and check her out. Rabit doesn't have a very creative name, but his look is certainly interesting. He is an 8 month old adult male that is awaiting space in the rescue. 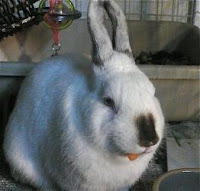 If you have plans to adopt a rabbit, we hope you'll consider him, as he definitely needs a furever family to love him. Rabit is located in Moscow, Idaho. Now let's move East to Virginia and check on Cookie Dough. How can you resist that name or this face? She's a young adult female that has been spayed. Cookie is available in Chesterfield, Virginia. Clyde came to his rescue organization from a hoarding situation, yet is a very sweet bunny. After what he's been through, he certainly could use a loving home that will give him comfort and a peaceful existence. 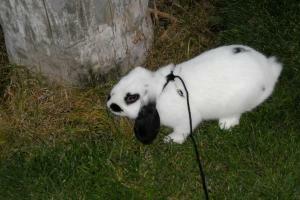 Most rabbits do not enjoy extremely active households. Clyde is available in Haymarket, Virginia. He is neutered and even has a microchip. Watch for more adoptable rabbit highlights in posts throughout the day, and be sure to visit some of the adorable bunnies you'll find in the linkups below. If you're a blogger who would like to join in, here are tips for participation at my Help Page. See my Help Page for more information, and to get the linky list code. Happy hopping! Thank you, Carrie, for hosting this hop! What a great (and timely) idea! Here's to many bunnies finding forever homes!! Thank for hosting, what a great idea! Oops! Thought I was being so original ... "Got Bunnies?" ... Sorry, would change if I could. Thanks for hosting this Carrie. It's great to bring attention to some of the other types of pets that are available for adoption. I'm know I'm tempted to add a second bunny, especially after looking at Petfinder!